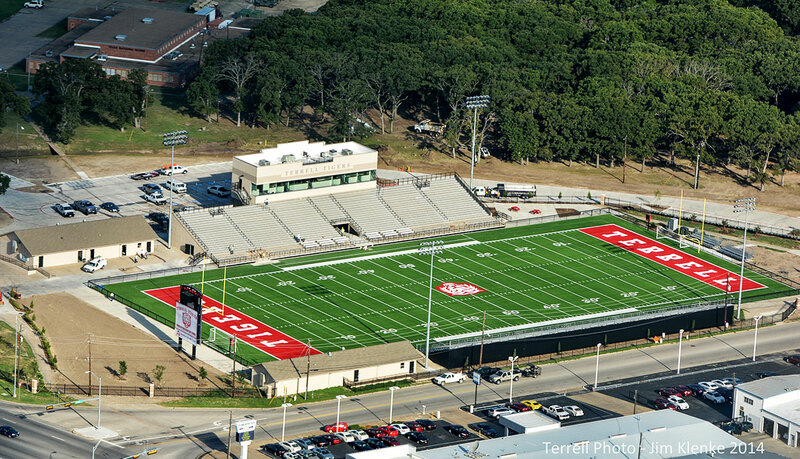 Terrell Memorial Stadium opened in 1948 and was named to honor those Kaufman County men who lost their lives in World War I and World War II. An interesting fact about this stadium is that at the time steel was still in rare supply post World War II. The home stands are made from steel that was commissioned for a World War II battleship that was put on hold at the end of the war. A Kaufman county Army administrator was able to procure the steel used for the home stands from the steel that was supposed to be used for the battleship, and that steel is still in place today. The stadium was renovated before the start of the 2014 football season. The renovations included a new press box, video scoreboard and artificial turf replacing the grass field.